If your job leaves you dissatisfied, maybe it's time you lose it. This may be the best time in history to start your own business. Best-selling author David Thomas Roberts, Renegade Capitalist™ and serial entrepreneur since age twenty-one, has created a guide for those who are no longer content to have someone else dictating their daily commute, their income, schedules and vacations. What does it really take for someone to jump off the employment treadmill and participate in the free enterprise system, unencumbered by traditionally accepted myths? 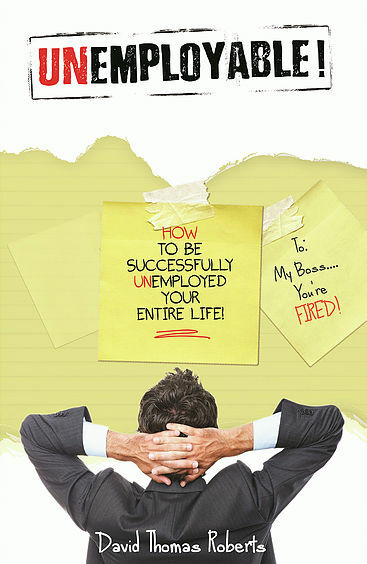 Roberts lays out business strategies and principles in his book "Unemployable! How to Be Successfully Unemployed Your Entire Life" (Defiance Press and Publishing, LLC). In college, Roberts became discouraged because no one was teaching him what he wanted to understand: how to become an entrepreneur. He then dropped out and within a year opened a multimillion-dollar air freight business with his brother. The downturn in the oil industry caught Roberts by surprise and eventually the business failed. Roberts took many valuable lessons from this experience. Undaunted, Roberts launched another business which he later successfully sold. Roberts has built numerous successful businesses; he is the founder and CEO of Teligistics, a leading multimillion-dollar telecom technology management firm started with $1,000 on a folding card table in a closet. Now, acknowledging the need for more opportunities, classes and degree paths for aspiring entrepreneurs, Roberts has advised major universities and MBA programs on the creation of degree paths and curriculum for entrepreneurial studies. Roberts has two best-selling political thrillers to his credit, "Patriots of Treason" (2012) and "A State of Treason" (2014). Inspired by his four children, he recognized the need for an unconventional business book to share his expertise. Roberts will soon release his fourth book, a continuation of the political thriller series, and is working on several more business books digging deeper into the principles of Unemployable! Roberts lives with his wife of thirty-four years near Houston, Texas. He has four grown children and two grandchildren. "Unemployable! How to Be Successfully Unemployed Your Entire Life"